Congratulations to "Taurus", the winner in Winter's giveaway. Thank you to all who participated! My guest post today is something serious, and a topic that has become something I’ve taken to heart to write about. PTSD in our veterans. 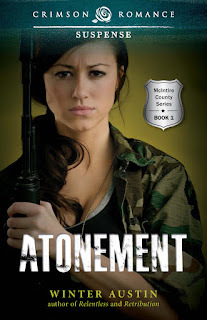 In my current novel, Atonement, the heroine, Nic, is suffering from the debilitating post-traumatic stress disorder (PTSD). As the novel progresses, the reader is taken deep inside Nic’s head as she endures flashbacks and panic attacks that she has to battle through. 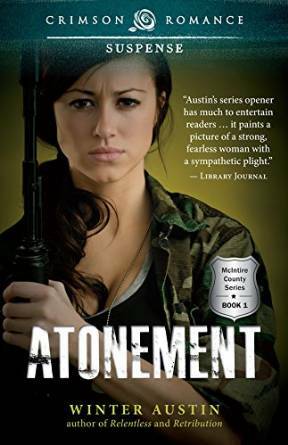 Almost every review that has come through on the book, the reviewer/reader has commented that my handling of the subject matter was done well and gave them a deep insight to what our service men and women who have PTSD are going through. PTSD is a scary disorder that not many people know how to handle or treat. A veteran who does get treatment for it, finds that a combination of certain drugs, and different methods usually help them. But as more research is done on PTSD, the researchers are finding that most PTSD sufferers have traumatic brain injuries (TBI), another serious disorder that current testing methods can’t spot, and in some cases have no definitive way to treat. Here’s where both disorders become deadly: every day 23 veterans take their lives. Suicide is a serious thread in Atonement, and how it effects those left behind from the fallout. Nic struggles with the weakness of someone close to her committing suicide to end his suffering, while trying to solve a rash of suicides happening in her sleepy, little Iowa town. In the last eight years or so, there has been more of a push for awareness of PTSD, and countless organizations have come into operation that reach out to veterans and their families to help. Some of these organizations are created by the very people effected in one way or another by PTSD. One of my favorites is Battling Bare http://battlingbare.blogspot.com/. My other new favorite actually uses dogs to help vets, for a short time they had a show on A&E, Paws and Stripes http://www.pawsandstripes.org/. There are so many out there, and they all need help and your support for them to be able to do what they do best, help veterans get back to some kind of a semblance of normal without the crippling effects of PTSD controlling them. From WWII to Vietnam to The War on Terror, anyone who has served in combat needs our support, and some times, we need to step in and fight for them when they don’t get the care they’ve sought. In what ways have you helped our veterans? The nightmare always came after a particularly bad day. The dream hadn’t come to her in a while, but this time around it seemed worse than before. It started the same, the figures of men moving farther away from Nic, through a curtain of sand. The more she yelled, more grit filled her mouth, choking her words. Suddenly the rattle of gunfire exploded. Nic screamed, begging them to listen to her. They finally turned, but their bodies became wisps of smoke. Dazed and unable to move, she watched as the men drifted away. But this time, the dream took a bloodier turn. This time, the men reappeared in a tunnel burrowed in rock. They stood before her, eyes glazed and faces bloodied. One by one they grabbed their hair with one hand, then a sword appeared in the other and each one whacked his head off. Their lifeless faces gaped at her. Nic bolted upright, screaming and kicking at the sheets tangled around her ankles. Breathing like an untrained marathon runner, her eyes jerked from one darkened corner of the room to the other. Home. Her home. Not the dank, far away hellhole in some God-forsaken, Middle-Eastern country. Her stomach lurched. Scrambling from the bed, she stumbled into the bathroom and barely reached the toilet before her gut made its final heave. She vomited repeatedly until all that remained were the dry heaves. Flushing the toilet, Nic leaned against the cool porcelain bowl and sobbed. Giveaway ends 11:59pm EST Aug 21st. Please supply your email in the post. You may use spaces or full text for security. (ex. jsmith at gmail dot com) If you do not wish to supply your email, or have trouble posting, please email maureen@justromanticsuspense.com with a subject title of JRS GIVEAWAY to be entered in the current giveaway. My father was a veteran. He rarely talked about his time in service. Only the funny things. We never pushed. Sadly, I have not done enough to help our veterans. I was on the board of our local historical commission, and each year we put on a Memorial Day program and usually had a veteran as a speaker. Some years we would also honor a veterans from a specific war/conflict. Thanks for tackling this subject. I think it's bad enough what our military have to deal with overseas, but it's so sad to hear what they also have to deal with once they return home, if they are lucky enough to do so. I have always been interested in PTSD. Although I don't know any veterans, as a hospice worker I met many people suffering from this. Donate to Home For Our Troops and a local center that helps homeless veterans. I have been involved in veterans' programs for several years. I am a Red Cross Service To Armed Forces lead volunteer. We have quite a few opportunities for volunteers here because we have a VA hospital and clinics in other communities. I have been doing the monthly birthday parties at the VA nursing home/rehabilitation center for the past 4 years and work on many other programs held at the VA facilities. We have just gotten a grant to help with programs at the VA that help young veterans deal with emotional obstacles, PTSD being one of the big ones many are dealing with. I am a member of a Military Advisory Council which is comprised of military., veteran, community, and business groups all working to support and give opportunities to veterans. My husband and I also belong to the local Honor Flight group which sends veterans to Washington, D.C. We are currently sending WWII and Korean veterans and will start on Vietnam veterans when we finish those. My husband is going as a Guardian on the October trip. (hit the wrong key) I am also on the board that puts on a Stand Down for homeless veterans every Fall. That will be coming up in October. This will be year 3 for our Stand Down. The focus will expand to include all veterans this year, not just the homeless.